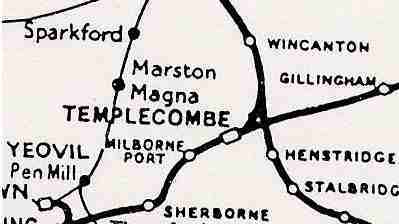 The Templecombe Junction Railway (TJR) was the link line which connected together the separate lines of the London & South Western Railway (L&SWR) and Somerset & Dorset Joint Railway (S&DJR) at Templecombe railway station in Somerset. This location became famous in the railway history of Great Britain for the complicated pattern of train movements which accompanied the daily operation of the connection between the separate 'Upper' and 'Lower' stations at Templecombe. This page gives a brief outline of the origins and development of the TJR as an integral part of the L&SWR and S&DJR at Templecombe. The first railway station at Templecombe was opened in 1860 by the Salisbury & Yeovil Railway (S&YR), when their single-track line from Salisbury to Gillingham was extended westward to Yeovil. This line was leased by the L&SWR, who subsequently absorbed the S&YR in 1878. In February 1862 the Somerset Central Railway (SCR) opened an extension of its line south-eastwards from Glastonbury to Cole, where it was to meet a northwards extension of the Dorset Central Railway (DCR) from Blandford. The first part of the DCR's extension opened at the same time from Cole to Templecombe, where the DCR built their own station just to the north of Combe Throop Lane. In August 1862 the DCR and SCR amalgamated to form the Somerset & Dorset Railway (S&DR). Then in August/September 1863 the S&DR opened the remainder of the DCR extension from Blandford to Templecombe, which passed under the S&YR line (later S&DJR Bridge 153) and then Combe Throop Lane (later S&DJR Bridge 152) to reach the DCR station and complete the through line. In 1875 the S&DR was taken over by the "Joint Committee" of the L&SWR and Midland Railway and became the Somerset & Dorset Joint Railway (S&DJR). 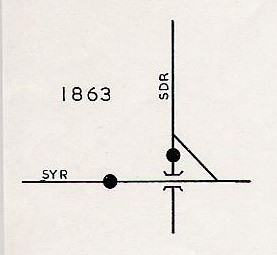 The S&DR constructed a north-to-east spur from their line in order to connect with the S&YR some distance to the east of the S&YR station. 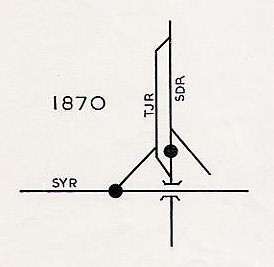 The alignment of this spur meant a reversal for trains going to/from the S&YR station, with a second reversal for trains to/from the southern part of the DCR. After the S&YR was doubled this spur only connected to the S&YR's Up line, over which S&DR trains then had to work 'wrong road' in order to reach the S&YR station. Most historical accounts refer to the awkward amount of shunting involved in using this spur and imply that there were (regular) transfer trips between the SDR and S&YR stations. There is an article by the Rev RB Fellows in the Railway Magazine of December 1932 (Volume 71) which gives considerable details about the train services serving the two stations, so it is interesting therefore to note that an official record from 1932 states "...apparently no use of the South Western Company's Templecombe Station was made by the Somerset Company's trains". In 1870 a new north-to-west spur was opened to connect the S&DR line directly to the S&YR station. This new spur left the S&DR line next to Horsington level-crossing at "No 3 Junction" and ran southwards parallel to the original DCR line, but at a higher level, before curving away towards the S&YR station. The spur was authorised under the Salisbury & Yeovil Railway Act 1866, but it was constructed as a separate "Templecombe Junction Railway" (TJR). A second spur was constructed (possibly at a later date) which left the TJR at "No 2 Junction" and descended southwards back to the original DCR alignment, which it rejoined at "No 1 Junction" just south of the SDR station. (See also note below.) The construction of this second spur is believed to have obliterated what had been the Up platform and loop of the SDR station. This work appears to have been done by the S&DR and charged to the L&SWR at a cost of £2,452, after which it was accounted as part of the TJR. At about the same time the original north-to-east spur was disconnected from the S&YR and converted into a dead-end siding accessible only from the S&DR yard. After construction of the TJR there were now two parallel routes for S&DR trains between Nos 1 and 3 Junctions - one via the original 'lower' road and the other via the new 'upper' road. In due course most S&DR trains called at the L&SWR 'Upper' station and by-passed the ex-DCR station, which fell into disuse. Eventually the ex-DCR station was closed to passengers altogether and in 1887 the connections at No 1 Junction were removed, after which the old 'lower road' became a dead-end accessible only from No 3 Junction and used purely for access to the S&DJR goods and loco yards. Consequently the TJR now formed an integral part of what had become the main line of the S&DJR from Bath to Wimborne. Also in 1887 a new Lower platform was opened on the S&DJR line, situated on the Up side between Bridge 152 under Coombe Throop Lane and Bridge 153 under the L&SWR, but in practice this platform was rarely used for scheduled passenger services. Under an Agreement of 31-December-1869 the S&YR became the owners of the TJR, but full Running Powers were granted to the S&DR, while the L&SWR (who were also Lessees of the S&YR) had use of the TJR and collected any tolls. After allowances the balance of earnings was to be split equally between the S&YR, L&SWR and S&DR and the three companies also shared the costs of working and maintaining the S&DR Junctions. 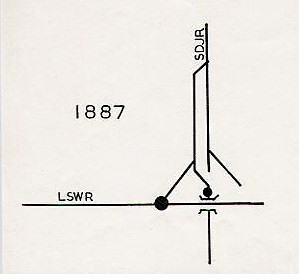 In 1878 the L&SWR absorbed the S&YR and acquired its interests in the TJR, after which there was a two-thirds/one-thirds split between the L&SWR and S&DR. It appears that, even by that late date, the TJR was still dealt with as a separate entity and the costs and revenues had to be allocated between the relevant parties. In 1894 the S&DJR agreed to credit the TJR receipts with £250 per annum in respect of trains using the TJR and not calling at Templecombe (Upper) station, whilst in return the S&DJR received £5 per annum for ex-SCR land (location unspecified) occupied by the TJR. The accounting situation was further complicated after the 1923 Grouping, when the L&SWR became part of the Southern Railway (SR). As successor to the L&SWR the SR became the owner of the TJR, but it was also in partnership with the London, Midland & Scottish Railway (LMS) as the "Joint Committee" operating the S&DJR, so as successor to the S&DR it became also a major user of the TJR. As a prelude to subsequent proposed alterations the "Joint Committee" sought a Report from their accountants in 1932. The accountants' Report dealt mainly with financial matters, but it does provide some of the interesting historical points which have been included in the notes on this page. A full copy of the Report papers has been deposited in the Archives of the Somerset & Dorset Railway Trust. In 1927 there was a discussion on the feasibility of permitting passenger trains to be propelled between No 2 Junction and the Upper station, thereby avoiding the need for a pilot engine. However it was decided that, with the curvature of the line and poor sighting of signals for trains approaching the Upper station, this could only be considered if the platform was not already occupied by another train, and apparently at this time it was quite common for there to be a second train there. Consequently it was felt that there would be very few occasions when the relaxed arrangements could be used. By this time the provision of a special 'pilot turn' engine had ceased, assistance being provided by engines off trains already waiting at the Upper station, so there was little scope for economy in engine power and the idea was dropped. In 1933 the signal-box at No 3 Junction was closed and its work was taken over by the box at No 2 Junction, the net cost of the alterations being £3,681. After all the financial calculations had been done the net annual saving to the Joint Committee was £123! It had been suggested as an alternative that No 2 Junction box should be abolished in preference to No 3, thereby avoiding the need to provide a separate gate-keeper for Horsington level-crossing, and furthermore connecting the old 'lower road' back into the line to Blandford so that it became the main line again. However these ideas were dismissed as they offered very little difference in cost and there was the perceived disadvantage of the added distance (between Nos 2 and 3 Junctions) that would be travelled by trains between the Upper station and the Blandford line. Later the same year the S&DJR's separate 'B' signal-box at the Upper station was closed and its work taken over by the SR's 'A' box, which had to be extended. Estimates for this work put the cost of alterations at £1,440 with an overall staff economy of £286 per annum. The calculations were complicated in this case because of the need to make a further overall apportionment between the TJR and the "Templecombe Joint Station", but the result was an annual saving for the Joint Committee of £87. A Memorandum (of unknown origin) queried whether the capital outlay could be justified because of the time that it would take to be recouped and made reference to "...the possibility of extensive alterations being undertaken at Templecombe in the comparatively near future...". The TJR was not the best solution to the problem of connecting S&DJR and L&SWR trains at Templecombe and over the years various schemes were proposed for building a new interchange station. However nothing ever came of these and when the Upper station was rebuilt later in the 1930s by the Southern Railway it remained on the same site with the same basic layout. However a new direct connection was added at the west end of the Upper station from the SR main line to the back platform used by S&DJR trains, which did enable through running between the S&DJR and the SR in the Yeovil direction. 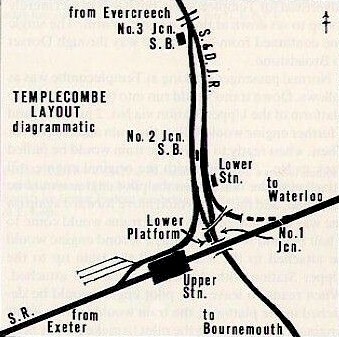 Nevertheless complicated operating procedures on the TJR remained a feature of the workings at Templecombe until the closure of the S&DJR and Templecombe station itself in 1966.